Location: Old Field, west of the entrance to Port Jefferson Harbor. Located at the end of Old Field Road. 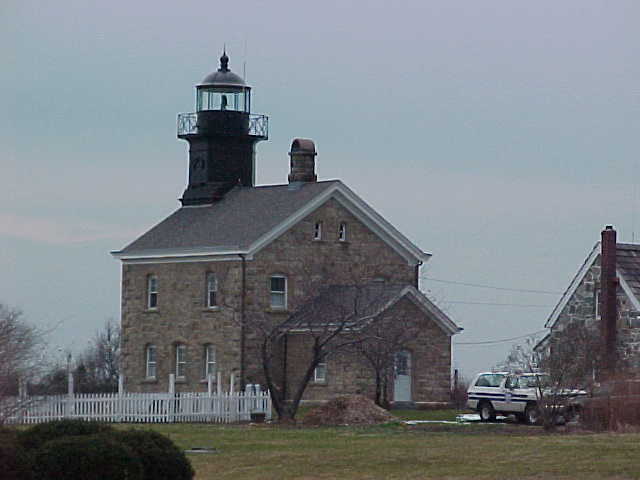 Original light (1824): 30-foot octagonal tower, probably similar to that built at Plum Island in 1827, with a five-room separate keeper's quarters. Current structure (1869): 34 feet tall; originally a fixed white light with Fourth Order Fresnel lens. Present light (VRB-25) flashes alternating red and green, with a ten second period between flashes; granite structure with black iron tower. 1823, October 10: Edward Shoemaker appointed first keeper. 1824: Original tower and keeper's quarters constructed for $4000. 1855: Fourth Order lens installed. Current use: Active aid to navigation/town offices. The surrounding area: If you wish to explore the area, nearby Port Jefferson and Stony Brook are rich in history, with many historic buildings. Port Jefferson has many quaint local shops, while Stony Brook has The Long Island Museum of American Art, History and Carriages on Route 25A. Public access? No. You may try to arrange a visitation of the grounds by calling the Old Field town offices. While the light is visible from Old Field Road, parking is prohibited anywhere on the road. Similar Lights: Plum Island, Block Island North and others. Other information: The iron tower is painted black, which is not its original color. Look at the Plum Island light photo and you'll see the original paint scheme of this lighthouse. Light is visible from the Port Jefferson Ferry service, which runs between Port Jefferson, NY and Bridgeport, CT.
Who to contact: Village of Old Field Administrative Offices: 631-941-9412. See the Old Field Point Photo Gallery. See a day at the Old Field Light, on August 8, 1999, including interior photos. "A seaside matriarch attired in granite and crowned with iron. An elderly granite lady who watches over the Sound with her flashing eye of red and green. the man who once tended the old Fresnel lens as though it were the rarest of jewels. Through nights of moonlight and nights of thundering skies this lady of granite with her flashing eye has saved both ships and souls. For decades she sat, deemed outmoded and old, her flashing eye shut, her soul in slumber. A new light nearby upon a tower of steel now flashed to the boats on the Sound, but it was only a tower of iron....no heart and no soul. her red and green eye a most welcome sight on a storm-tossed night!!"